I had been overrun with all types of solicitors at my front door. I painted a lovely and very readable "no soliciting" sign and put it on my front door. Would you believe that no one thinks it applies to them? I am dumbfounded. Yesterday I had a siding and window salesman tell me it was OK, because he wasn't selling anything, only doing a survey (ha). Just now I had a man with a couple of notebooks at the door who said the same thing. I promptly said "read the sign" and slammed the door in his face. I'm angry about this and wonder if others are experiencing the same thing and how you deal with it. I know the feeling. 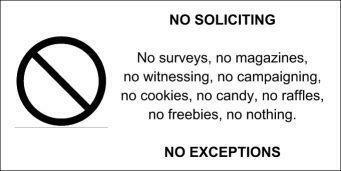 We have 2 'No Soliciting' signs up that often get ignored. If it were just people honestly trying to make a living selling door to door I might not mind as much but we have had several scammer types come lately and it doesn't even feel safe to answer the door anymore. We don't answer the door if we don't know them. Look to see if you know them, good luck. Best thing I ever did was to have a peep hole installed in my front door. If I don't recognize the person at the door, I don't open it. No peep hole? Is there a side window you can peek out of to get a look? I put a sign on my door that says Day Sleeper. I printed in in large letters on hot pink paper and taped it under the knocker. It worked like a charm. Even the UPS man hesitated to knock, but I heard him drive up & looked out the window. He was standing there, not sure if he should knock, but the package needed a signature. I, too have a sign and it's ignored. Don't misunderstand, I'm not an athiest but I even get upset when it's people from churches. I have said "did you not see the sign". Comment "I'm not selling anything." You'd think it was obvious that they to were not invited. I'm going to print that sign! We ran through a large number of solicitors the first couple of weeks after we moved into our new house; the siding guy, the landscapers, on and on. I put up a sign, too, and nobody read it. The day the guy from the alarm system showed up, I finally got the bright idea of permitting our big (goofy, but scary-looking) dog to bark her heart out at the picture window by the front door. I put her in a sit and opened the door and asked him if it looked like I really needed an alarm system. Now, whenever it looks like someone's approaching the house to try to sell us something, I just put the dog to work at the front window and ignore them. Susan, they know the sign applies to them, they just don't care. I think the sign ticks them off and they are bound and determined to tick us off. Anyone that rude deserves the door slammed in their face. Thanks to everyone for suggestions. Kaelle, that sign is wonderful and I printed it out and am going to decoupage it over the sign I painted. If that doesn't stop it I don't know what will. I was polite in the beginning, but I can't imagine what people are thinking when they see the sign and knock anyway. I even had a guy get down on his hands and knees and reach into my front door and spray some cleaner on my tile and rub it around with a rag after I had told him I wasn't interested and pointed to the sign. Just the craziest most unbelievable stuff! I do the same as OliveOyl. There are too many home invasions in my area. I don't think they want me to open the door and they are facing a 100 pound Doberman. You could even get a toy camera and mount it outside your front door. Okay, my warped sense of humor says to fling the door wide open with a totally panicked and concerned look on your face and say, "You need to get away from here as quick as possible cause this house is under quarantine and the disease spreads through the air and is floating out towards you as we speak!" If they ask what disease say something like Swine Flu ;-) LOL! I did something to a pair of Jehovah's Witnesses that just would not go away. I respect all faiths, but it was hot, I had no air conditioning at the time, I was in my 'morning sickness that lasts all day' phase of pregnancy, and I had had it with them. While our car was in disrepair, we had moved it to the grass on the side of the property. When we moved it back to the drive, it left a huge brown rectangular spot that was visible from the road. Two forms of photo ID, your social security number, and your Email address. You are invading my privacy, so I want to know who you are, run your criminal background and find out where YOU live. I simply do not answer the door if it's someone I don't know or am not expecting. I have a large bow window near the front door and I can sort of see out to the front stoop through the blinds w/o me being seen. There is no law that I know of that says you must open your door to strangers, and I don't! Even if I see kids out there trying to sell something, I don't open. It's my home, my rules. Our town does offer a special No Soliciting sticker but I did read that religious groups are exempt from that. I do not like the idea of someone trying to sell me something at my home. I will decide what I want to buy out in the stores. I figure for most anything the person can just leave information at the door. Hey after a while when no one answers, they just give up and move on. I just ignore and pretend like I was busy and couldn't get to the door. I owe them no explanations tho and feel much safer not to unlock my door to strangers. My town actually has printed stickers that are sent to residents at their request that say NO SOLICITING and any one coming around door to door should have a town issued photo identification badge, if they don't have one, we are told (and it is on the town website) to send them away and notify the police with a description. 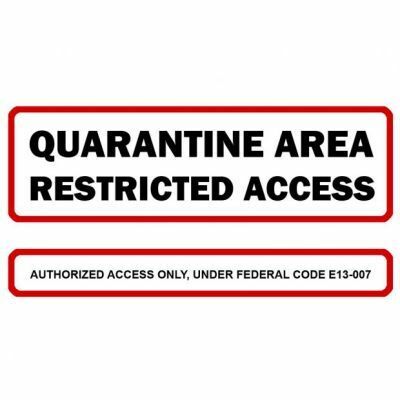 I have the sticker on my door, so does my neighbor and I have even seen it on businesses. I don't answer my door anyway unless I can see who it is through the peephole or looking out (discreetly so they don't see me) the window. I live alone and no way am I opening my door to anyone I don't know. I absolutely love some of the suggestions given, they are great (funny but who knows, they just might work). I found a cute sign that says a lot! it's on a piece of wood, painted white, and has pretty flowers. I guess it was cute so it would not offend, but get the message through. If you were invited -- Knock. If not go away! Didn't work on my mom, she went around to the back door! Ha! Ha! What gets me is I live in a security building and still have a few people come to my door, and they aren't people who have family members in the building. I figure they wait until a resident is coming or going and walk in. I had one girl that really made me mad, she was one of these extremely perky, bouncy things, she was taking donations for, I think it was the muscular dystrophy telethon, supposedly it was a contest of some kind. I turned her down, and felt like asking her how she got in the building. Jehovah's Witnesses and Mormons really annoy me when they come to the door. Don't they realize if a person wanted to attend their church we would be doing it? Find out if the city or county you live in has the Green River Ordinance. We do, and it's fun to be able to tell a solicitor that what they are doing is illegal and punishable by law. I wish I had my mother's talent for "irish diplomacy". She was able to tell a person where to go that they looked forward to the trip. Once, I came home from work to find two young men vacuuming the living room and doing the dishes while my Mom sat at the kitchen table sipping coffee and telling them how great it is to be a Baptist! Now, for me, My boys, (an old beagle/bassett mix and an English pointer) who both have barks bigger than themselves will seem to be tearing at the door. I only open the door far enough to stick my head out while I pretend to have to "fend off the dogs" the entire time... If the person seems dodgey. I'll pretend I'm not going to be able to hold the boys back much longer...meanwhile they're putting up such a fuss because all they want to do is see who's there! ha ha ha! Nowadays, once in a great while someone will just leave some kind of tract in the door. They don't even knock any more. My daughters both are christian and my husband and I are pagan. I do pass the tracts to the girls in case they're interested. Check your city's ordinances. The city I live in prohibits solicitors as long as you have it posted. Get information from the solicitor, such as company name, their name & even a license plate number. Call the authorities, they are subject to fines. Nowadays, one should be careful about opening doors to strangers! If you don't have one, at least get a chain, so you can open your door to see who it is & then say no thanks if you are in the mood - or no solicitors - or do you have i.d. - or cite the ordinance - perhaps duplicate it & hand it to them thru the slit in the door? Then close the door in their faces. You also are not obliged even to open the door to people you have not invited into your home! Ignore them! Hi. I had a good laugh over the brown spot left by the car. My mom had Jw's come over all the time because she lived alone. I happened to be there for the weekend and they showed up and wanted to chat. They could smell the bread baking and was commenting on it and the sounds of a fresh pot of coffee. They were always referring to thier bible, I finally got annoyed and told them that if they wanted to chat we could do it while we worked. I said we had the garden to weed and the chicken coup to rebuild before winter and the feeding of the chickens to do. We also had a carpet to lay which meant moving all furniture into different rooms and outside. Needless to say the y had pressing business else where. My dad had a hilarious one too when he was still alive. One Saturday a JW came to the door told my dad he and his fellow church goers were prepared for the end of the world which was coming on Saturday. (he was very specific) my dad said that he was prepared and him and God had an agreement already so he wasn't concerned. Saturday came and went. The next Saturday, the same fellow showed up. My dad opened the door and said :well we're still here, so I guess one of us was wrong. Poor guy didn't know what to say, he just turned and left. Boy, you guys are pros at this! I wished I had asked on TF before I spent the time and energy painting my little ineffectual and ignored sign. And thanks for the many laughs. Seems like I'm not the only one affected by this. Best to all. Funny, I have a sign on my door too that says no menus or pamphlets. Well I get at least 4 menus per week. I have called the eateries and even mailed postage due letters. Nothing has helped. Hi, lots of good ideas! I remember reading a while ago that solicitors know that weak-willed people who can't resist solicitations usually have 'no solicitors' signs -- in fact, the solicitors make a point of trying to sell to those homeowners! Here's a radical concept! Why not try honesty with the people you don't want calling on your door? You could just come out and say, "I don't want you, or anyone from your organization, calling on me anymore." If someone else mistakenly calls again, you could just keep repeating the same line mentioned above. Also, if safety is a concern, just tell them from your window instead of your door. No doubt, they would appreciate your courageous honesty as well. After all, I'm sure they didn't get themselves out of bed, and out their own door, to come and play games with the people they're calling on. Depends on your law in your area, but most no soliciting signs don`the apply to charity, politicians or religion groups. But a no trespassing sign covers everything one by law. I had a set of JW approach me while I was in the yard working... One lady said how pretty that flower was & if it was Wandering Jew. I said yes, kind of like you.